Phrase used to show the amount of time a tequila has spent in contact with oak wood, usually stored in either a barrel or vat. The alcoholic liquid produced from the first distillation when making Tequila. Stone pit where mezcal piñas are baked. Usually 12015 feet in diameter and 6-8 feet deep. An infestation that corrodes the leaves (pencas) of the maguey plant. Pearl or Shell - A bubble that remains on the surface of the tequila after serving it or stirring it. To see if it is there, close the bottle tightly. Hold it upside down, then turn it right side up - the bubble should appear and continue to float. If the perla does not appear, the liquor is most likely a mixto. The spiny, broad, leaves of the agave plant, used by early Indians as needles and paper. In cultivating the agave, these leaves must be cut on the proper angle. If they are cut too short, the weight of the piña could be lost; if they are too long, the plant could become difficult to handle. Literally translated at horse-trainer. Agave field worker who does the desquiote. Unrefined brown sugar cones used when making mixto tequilas to speed fermentation to be able to use immature and fewer plants. Translated as pineapple. The piña is the pineapple-shaped heart of the blue agave plant that averages between 40 to 70 pounds, but has been known to weigh in at 150 pounds. The hearts are cooked in traditional brick ovens or modern autoclaves and then crushed, shredded or grounded into a pulp. The juice from the piña is then distilled. The piña is also called cabeza (head) and corazon (heart). 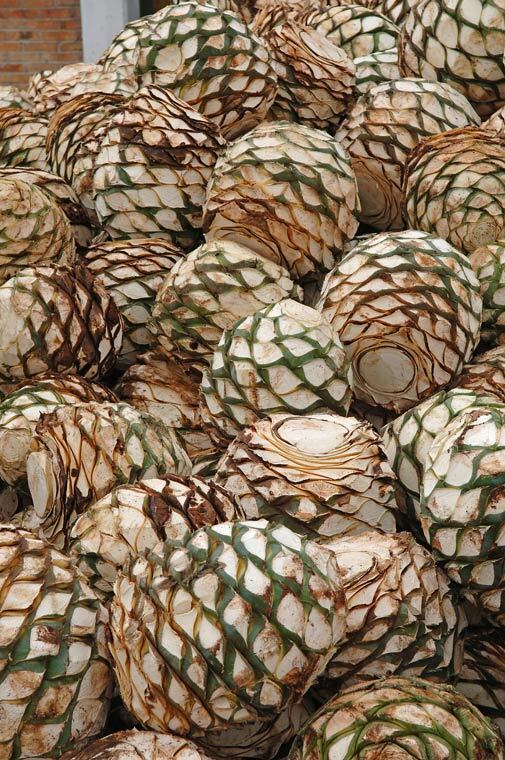 Approximately seven kilos (15 lbs) of raw agave piñas are needed to produce one liter (one quart U.S.) of tequila. Tanker truck used to transport mixto tequila. Pipas also transport water to many areas within Mexico where municipal water systems do not exist or are not adeuate. Large barrels. Wooden depository with a capacity for 80 barrels, or 5,280 liters. There can be other sizes. Clear, unaged tequila that is normally bottled right after being distilled. When the clear white tequila drips from the cooling coils of the alambique, it is correctly called silver or plata, but is more commonly called white or blanco. Pasture Land. 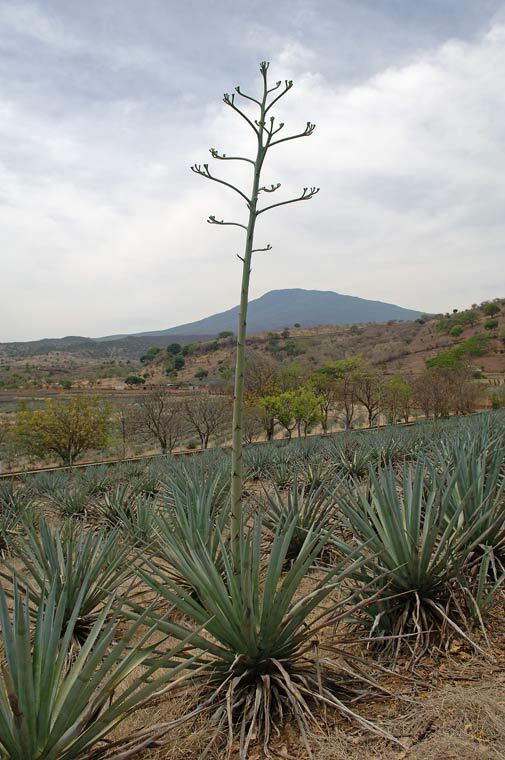 The way they name the agave plantations in Tequila; they are also known as trains, ranches or campo de agave (orchards). A unit of measure of the amount of alcohol in liquor or spirits. In Canada and the United States, proof is exactly twice the percentage of alcohol. 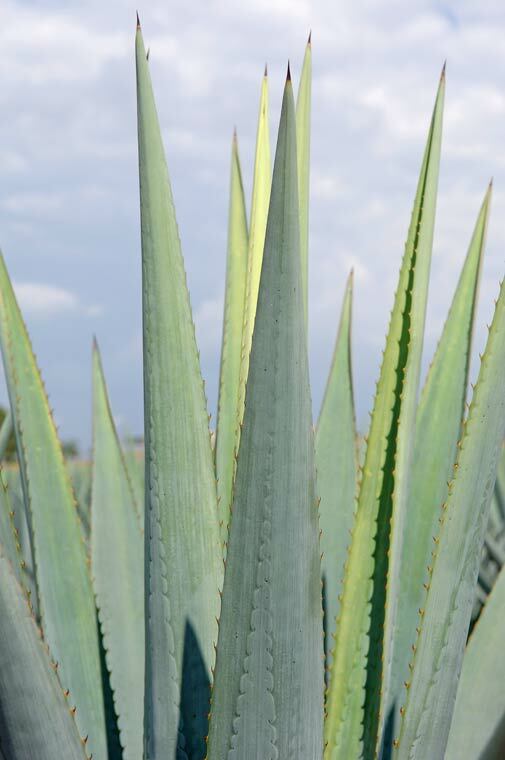 A once-in-a-lifetime, for the maguey, stem or flowering stalk that grows from all agave plants to produce seeds. The quiote is sweet and can be boiled or roasted, and eaten. Also called quixotl. It may reach 25 to 40 feet high so that the seeds grown at the top of the stem can scatter with the wind. The unofficial term for a specially produced tequila product. Usually an añejo, but may be a reposado. The first definitive level of aging is termed reposado or rested and madates that the tequila remain in wood for a period of two months but no longer than 12 months. This is a requirement of the Mexican government. Each distillery has its own preference for the type of barrel used in aging. Some of the most common are made from french oak or white oak. The traditional Mexican spicy and refreshing non-alcoholic aperitif that is usually served chilled alongside a shot of Tequila. Sangrita is traditionally blended with the following ingredients: tomatoes, fresh lime juice and orange juice, onions, salt and hot chili peppers. Sangrita is the Spanish diminutive for “blood” and is served in a “caballito”. Sangrita should not be confused with the popular Spanish fruit and wine elixir, Sangria. The agency to Promote commerce and Industry in Mexico. SECOFI is a mandatory agency for registry and vital to foreign manufacturing. Without SECOFI's approval, you cannot import raw material into the country or export finished product.